When you hear the term “All Star Band,” one question comes to mind… who’s in it? The American Vinyl All Star Band is composed of the iconic members from your favorite classic rock bands. Jeffery “Skunk” Baxter founding member of Steely Dan and guitarist from the Doobie Brothers, Skunk unquestionably is one of the rock/pop world’s most influential guitarist, having played on over 2500 recordings, Barry Goudreau guitarist formerly of the band Boston, who’s record is still the fasting selling debut album of all time. The melodic sounds of Leroy “LSR” Romans keyboardist of the Wailers and Third World, with the beat of Robert “Mousey” Thompson drummer from the James Brown Band. Danny Beissel lead singer from Fosterchild fronts this powerhouse roster of talent. Tim Archibald bass guitarist formally of RTZ, Peter Wolf Band. 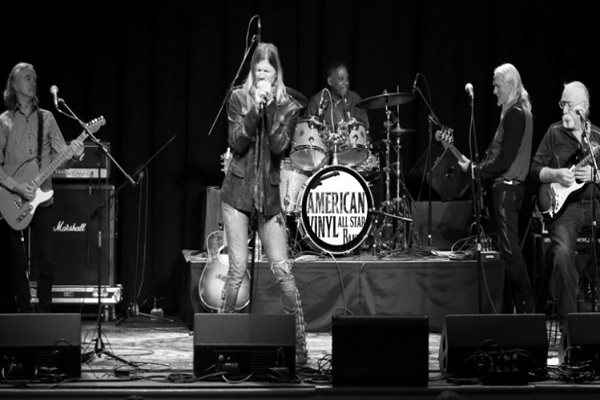 Spend an evening with The American Vinyl All Star Band as they play hit after hit of the legendary music from their original iconic bands.